Art does away with tired old crackers, replacing them with blinis (aka mini-pancakes) for a refreshing upgrade. (They also provide a spontaneous smudging opportunity in a pinch.) 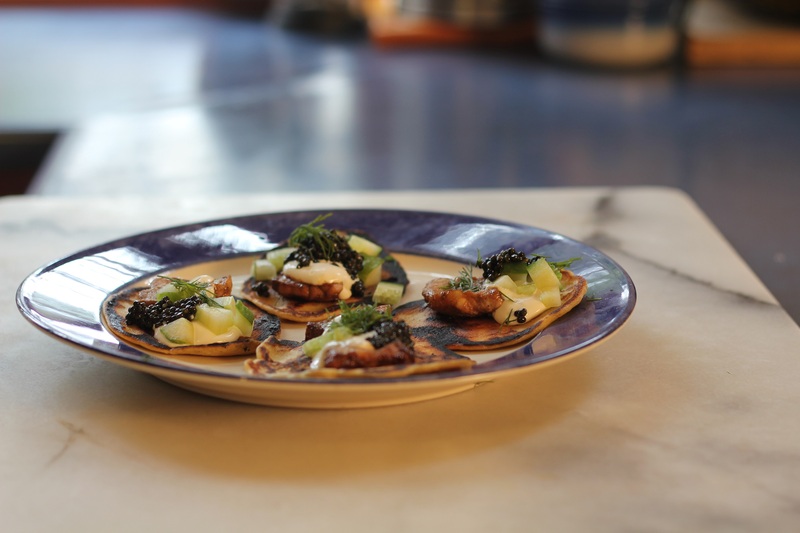 The blinis act as a platter for the reunion of old buddies Sturgeon and Caviar, which are paired with crème fraiche and cucumber cubes. Thyme butter, brown sugar and Art’s tried and true liquid smoke bring the flavour to this surprisingly posh offering from the bush cook. • Start by cracking an egg into a mixing bowl, then whisk together your egg and milk. Add a pinch of salt and continue to whisk everything together while adding your buckwheat flour and baking powder. • Once everything seems to be well mixed, add all the melted butter and some of your white flour. Continue to add in flour until the mixture is that of a normal pancake consistency. When you have achieved this, all the blini mix to sit for a couple of minutes while you warm a griddle. • Once the griddle has warmed to a medium heat, pour a bit of Canola oil on and try a test blini. Don’t “crank” your heat, like Art does. You’re roughly trying to make your blinis about 2 inches (5 cm.) in diameter. • Start by taking your cucumber and squaring it. Cut straight down on all sides, this makes it easier to work with. Next slice the cucumber in even slices. Take those slices and cut the length wise again, then cut the cucumber into small cubes. • Slice the sturgeon into pieces about 0.4 inches (1 cm.) thick and 1.5 inches (3.8 cm.) long. • In a bowl mix together your brown sugar, soya sauce and liquid smoke for the brine. Either brush on the brine to the sturgeon or dunk the sturgeon pieces into the bowl. • In a medium heated pan melt the butter and place in the thyme. Once the pan in warmed place in the pieces of sturgeon. It will only take a few minutes to cook the fish. Using a spoon collect some of the thyme infused butter and pour it over your sturgeon. Flip the sturgeon and do the same to the other side. • Hopefully your blinis aren’t as black as Art’s. Place them on a plate, then top with the fried sturgeon. Then a dollop of crème fraîche, followed by a few cucumber cubes, a small dollop of caviar and top the whole thing off with a piece of dill.